In the eerie calm of the setting sun, the silence was broken by shuffling footsteps, some quiet moans and gasps of shallow breathing. The footsteps stop, and following a pause, sharp knocks on a door are heard. The door is opened by a young man, in a clean white loin cloth around his waist. He sees 4 men, with anxious looks on their faces. The young man looked at the patient. An athletic man in his early twenties with a bloodied cloth around his face, under which he sees that his nose was avulsed; hanging on to the face by a small bit of skin. Most of the member was crushed beyond salvage. “Please wait here, I'll bring Guruji. Meanwhile, first aid will be done to your friend by one of our fellows here”, and went to call his teacher, after making sure the patient was put in the treatment room table and attended to. In a room away from the main complex of the Gurukul, the teacher was observing the vegetables that were “operated” on earlier in the day by his students. “They are getting better” he thought, and smiled to himself. He could tell who the student was just by looking at the vegetables. Though it was not like the actual human body, it gave them the necessary practice and dexterity required to be efficient surgeons. He was almost done inspecting all of the exhibits when he heard a soft knock on his door. It was one of his disciples. He paid his respects and proceeded to explain to the teacher about the patient who they had just received. The teacher didn't want to waste any more time, so much of the information was explained en route to the treatment room. They enter the room and sure enough, there's a young man with a bleeding injury on his face, which was now covered with clean cotton. His feet held by two of his younger disciples, and another one already giving him wine that would eventually knock him out. 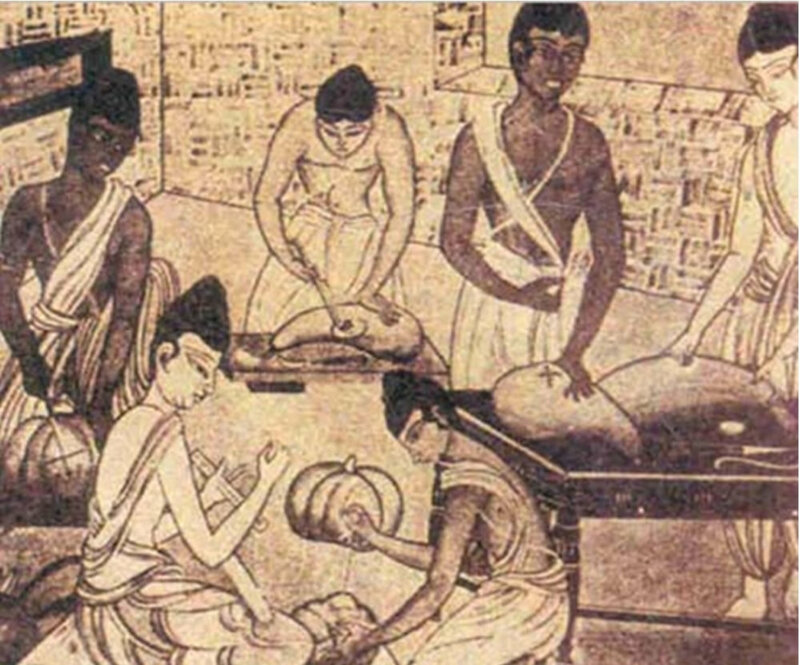 The teacher looked at the wound, examined him thoroughly to see if he had any other injuries and asked his disciples to get the instruments for Nasikasandhana (repair of the nose) ready while he went to bathe and cleanse himself before the procedure. The teacher was back a few minutes later. After ensuring that the patient was anesthetised adequately, he took a good look at the wound. His nose, or what was left of it, was barely hanging on to his face. There was one small area of bleeding. Nothing left to save, “It needs to be excised and repaired” he thought. The wound was already measured by one of his disciples with a leaf and the exact dimensions were marked on the patient's right cheek. The teacher cleaned the area, ensured that that cleansing liquid did not enter the patient's eyes or nostrils, and held his hand out for his first instrument - the Salya, a sharpened and sterilised arrow head used as the surgical blade. Using the surgical blade, he cut off the redundant skin with almost a robotic precision, removed all the unhealthy tissues, and freshened the wound. Once satisfied, he used sterile cotton dipped in an alkali solution to cauterise the wound to ensure that the wound wouldn't bleed later. Following this, he made the skin incision on the cheek, making sure to keep an area of skin close to the nose intact; rotated the flap and covered the defect. All of this was observed in awe by his disciples. Once he was satisfied with the coverage, he took the stems of a castor oil plant and put them into the patient's nostrils and quickly started to suture the skin over the defect with sterile fine silk thread that was made earlier that day. He then proceeded to close the raw area on his cheek with the remaining silk thread and covered both areas with a powder mixture of red sandalwood, liquorice and barberry plant. Sterile cotton was applied and some sesame oil was poured over the wound. He advised his disciples to re-dress the wound every day, and went to find the patient's company to inform them of the proceedings. The pioneer of surgical sciences in Ancient India. Though dramatised by imagination, most of these facts are recorded in his compendium, “The Sushruta Samhita”. In this book, he describes an incredible 1,120 conditions, over 120 surgical instruments, and almost 300 surgeries in 184 chapters. In this particular anecdote, what has been described is what is called a reconstructive flap in modern surgical practice, for covering a defect over the face caused by injury. Sushruta, most famously known for his rhinoplasty, was also responsible for creating a structured curriculum of medical education. He described how the period of education was to be for a duration of 6 years; at the start of which the disciple is made to take an oath, one taken to persevere to preserve human life; very similar to the Hippocratic Oath that many of us know. In his book, he has also described his extensive study on the Human Anatomy with detailed recordings of his methods of dissection and his findings. There are also chapters on the surgical education of students where he speaks about learning skills by mock-surgeries on vegetables and other innovative workshops for hands-on skill development. He explains that a person of healthcare must be kempt, nails and hair short and must be licensed by the king to practice in his area, while warning that improper surgical intervention for greed or due to lack of knowledge of the disease process would lead to unwarranted consequences. There are reports suggesting that his works reached Persia and many other places, translated to their native languages which helped healthcare progress exponentially. Even many current age surgeons agree that Sushruta was probably the greatest surgeon of his times. The complete list of Sushruta's contributions is exhaustive, and we can never really know for sure as to how much more he contributed to the field of medicine and patient care, with descriptions on complex surgeries like prostatectomies, midwifery and obstetric care, abscess drainage, dressing of wounds and classification of burn wounds with detailed accounts of management of all these conditions. But it's amply clear from his words, translated from Sanskrit in the early 1900s, that healthcare is not just a field of science; it's a way of life and this genius of a man has described practices that are apt even today, many centuries ago. 1. Agarwal, Ramesh K, et al. “Chapter- 8: S Saraf, R Parihar. Sushruta: The first Plastic Surgeon in 600 B.C. The Internet Journal of Plastic Surgery. 2006 Volume 4 Number 2.